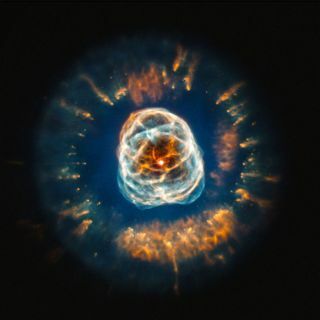 This image of planetary nebula NGC 2392 uses data from the Hubble Space Telescope to show the intricate pattern of the outer layers of the star that have been ejected. Image released July 11, 2013. Hello space fans and welcome to our new look! SPACE.com has been redesigned to create a more contemporary look that both improves navigation and cuts down on clutter. SPACE.com has grown significantly in recent years, with more staff producing more stories and far more people visiting the site. Our new look aims to better reflect the depth and breadth of coverage, and we hope you like it. Without sacrificing astronomy and spaceflight coverage, we’re leaning into the technology of space exploration, with more coverage of the innovations and incredible technology that drive our quest to understand the universe. Our night sky coverage is among the most comprehensive on the planet. We provide timely skywatching guides for major and minor events, and we recently beefed up our monthly overview of the night sky. We've created a vast catalogue of space reference material that readers have responded to enthusiastically. As we iterate on the site design, we’ll be organizing this in the future to have more accessible functionality. We recently launched Expert Voices: Op-Ed and Insights to offer up insightful commentary and informed perspective on news, current events, innovations, big ideas and ongoing research, such as this piece about the Mars One project and this one on how to save planetary exploration. SPACE.com has always aimed to be the primary source for thoughtful, thorough news and analysis of everything out there, and we hope you enjoy the ongoing, amazing journey celebrating space exploration, innovation and discovery. Keep looking up!